I’m astonished this pretty beastie has been hiding from us for so long – according to the Equus Automotive Facebook page, images were released almost a year ago. 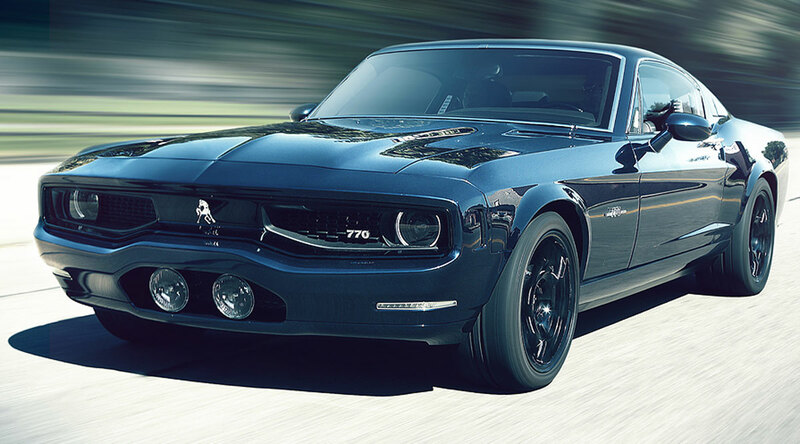 As you can see from the gallery, the 2014 Equus BASS770 is pure Detroit muscle, citing just about every styling cue from the pantheon of old greats, including the fastback Ford Mustang, the Dodge Challenger and even the ’68 Camaro. The numbers are impressive: 3.4 seconds to 60 miles an hour (approx. 96 km/h), sprinting on to 200mph (321.8 km/h). Under that long hood is a supercharged V8 from the outgoing ZR-1, developing a prodigious 640 ponies (a coat of lacquer away from 471 kw). Translating power into forward motion is the job of a six-speed dual clutch manual, rear-mounted to counter the weight of the engine. While I was unable to discover the weight distribution, you’d think that after a six year gestation, the figures are close to even. Nor is this your Pappy’s crude lump of pig iron from days of yore. The 770 is all about modern, lightweight materials, with an aluminium chassis clad in aluminium panels and carbon fibre inners. Still, the entire package weighs in at a hefty 3640lbs (1651kg). Handling isn’t left up to Bullitt-era leaf springs, live rear axles or cross-ply tires either. Equus Automotive have endowed the 770 with all the modern acronyms: Performance Traction Management, Active Handling System, Magnetic Selective Ride Control and variable-ratio power steering are standard. Grip is handled by Michelin Pilot 255/40 ZR19 tires in the front and 285/40 ZR19’s on the back. Inside there’s more cues from earlier cars, tastefully executed, seats dressed in leather, along with all the accoutrements you’d expect of a 21st century car. From the Equus Automotive site: “Complete black leather interior (alcantara® ceiling), A/C, GPS, radio/CD/DVD player, USB connector, tire pressure monitor, cruise control, airbags, Isofix… Specifications could be adapted depending on markets regulations”. Now for the stinger – if you want one, have at least $253k ready, and $290K for the full spec model. That won’t mean a lot if you’re loaded like Leno, and rest assured, you’ll see it in his stables.